Bathroom remodeling does not have to be a headache! The right home remodeling contractor can transform your old bathroom into an elegant new space. Are you living in a home that you just love but might need just a minor update to its look? Consider a custom design for your bathroom remodeling. We all loved the 1980s, but some of the color choices people were making in those days are, in hindsight, a bit curious. When you hire us as your bathroom remodeling contractor, we will custom design a product just for you. Our owner has more than three decades experience and personally drafts and designs all our products. When it comes to home remodeling, there is no better choice. Contact us today to see what we can do for you. From our very first meeting, we will be the bathroom remodeling company you will be telling your friends about for years. We handle the entire process, from the initial design through the final steps of rebuilding. More importantly, you will be there every step of the way. That is the point of custom work! When we draft your custom bathroom remodeling, we will be using your input to make it exactly the way you want it. No beating around the bush, no slick talk, we are very straightforward and you can be sure you are getting what you want. The owner will always deal directly with you to make sure you are getting exactly what you had in mind. Why not set up a meeting so you can tell us what it is you are looking for? This will be a hands-on process. Our hands will be on the tools during the bathroom remodeling, and your hands will be there every step of the way to make sure you are getting what you want. As home remodeling contractors, we have learned that there is no substitute for giving our clients the custom work they dreamed of. We will handle the entire bathroom remodeling process for you. We are a licensed general contractor, which means we will not subcontract any of the work out. You can count on us handling the entire process, which means less stress and no headache. Call us today so we can get started! We are here to make bathroom remodeling easier on you. We have the experience, and we have the talent, and you have the dream. When the time comes to renovate your space, our bathroom remodeling company will be here for you. 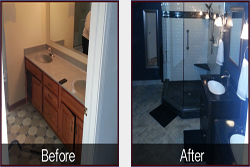 Licensed and experienced in home remodeling, we will bring life to your idea for your bathroom. A fresh, updated look will make such a difference to your home, and it does not have to be painful to do. Contact our straight forward staff today to find out exactly how we can help you turn your bathroom into an elegant area. 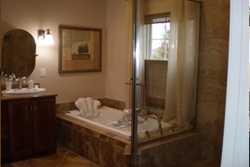 We do bathroom remodeling in Carmel, Fishers, Noblesville and surrounding areas.